Jerry J. Mundil, 86, of Leigh, died Wednesday, April 26, 2017, at the Stanton Nursing Home. Funeral Service Saturday, April 29, 2017 10:30 A.M.
Jerry was born March 6, 1931, near Dodge, Nebraska to Jerry and Ida(Karel) Mundil. He attended school through the eighth grade and as the oldest son stayed home to help farm. In 2001, he received an honorary diploma from the Nebraska Board of Education as a veteran. He served in the US Army from Dec. 12th, 1952 to Oct. 21st, 1954. He was in the Korean War Zone from June 9th, 1953 through Oct. 6th, 1954. Jerry attained the rank of Sargeant assigned to the 21st AAA-AW-Batallion. On June 14, 1955, he married Lucille Matthies at New Zion in Clarkson. They lived and farmed near Leigh, moving into town in 1975 where they both worked as custodians at the Leigh High School for over 20 years. Jerry was a member of the church and a Lifetime Member of the Clarkson VFW. 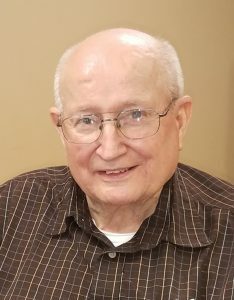 He enjoyed playing cards, gardening and woodworking, and loved nothing more than watching his children and grandchildren in their sports activities. He could listen to polka music 24 hours a day. Jerry is survived by his wife, Lucille, of Leigh, two daughters;Penny(Dean) Janousek of Clarkson and Patty(Dale) Shotkoski of Fremont, a son, Paul(Eileen) Mundil of Breese, Illinois, two brothers;Joe(Janice) Mundil of Winside and Ed(Joan) Mundil of Hooper,a sister, Adelyn Prchal of Omaha, four grandchildren;Grant(Becky) Janousek, Reed(Kiley) Janousek, Chris(Carrie) Rowell and Candice Rowell. He is also survived by three great-grandchildren; Alleigh Janousek, Mason and Beckett Rowell. He was preceded in death by his parents, one brother Milo Mundil and three sisters; Helen Sperl, Agnes Nadrchal and Evelyn Vacha.